I’ve never been a cat person, mostly because my family was dog people and I’ve never had an opportunity to be a cat person. That, and the fact that I’m allergic. I didn’t discover I was allergic until I was about 18, and so I mostly just avoided them after that. It’s not that I detest them or anything. But, this little kitten has kind of stolen my heart. I love her. I think it’s a her. She was born next to our house in a litter of four. The mama cat would come periodically and take care of them, and then she would move them to new places. So every 4-5 days they would disappear. I can’t pretend it didn’t break my heart a little every time I discovered they were gone. But then, two of them came back. I would put out a little kibble when I saw them, and in the process I fed many skunks at the same time. We called the beautiful little calico, Callie. She was my favorite and I secretly never wanted her to leave. And we called this black one Rocky, because she was a little fighter and wouldn’t hardly have anything to do with anyone, while the others were more gentle. A few days passed and they disappeared again. I was resigned, you know. It was probably best that they go on their way, find a home or stay feral. I told myself I gave them a good start and that was the end. It’s not like I need any cats, I’ve got plenty of animals around here, and that’s not counting all the ducks in the duck pond. But one day, this little Rocky was back. And she hasn’t left since. In fact, she’s started coming up to us, instead of staying hid out in her original place beside the house. EK and I read a book called Meet Muffin, about a cat of course. So EK started calling her Muffin. 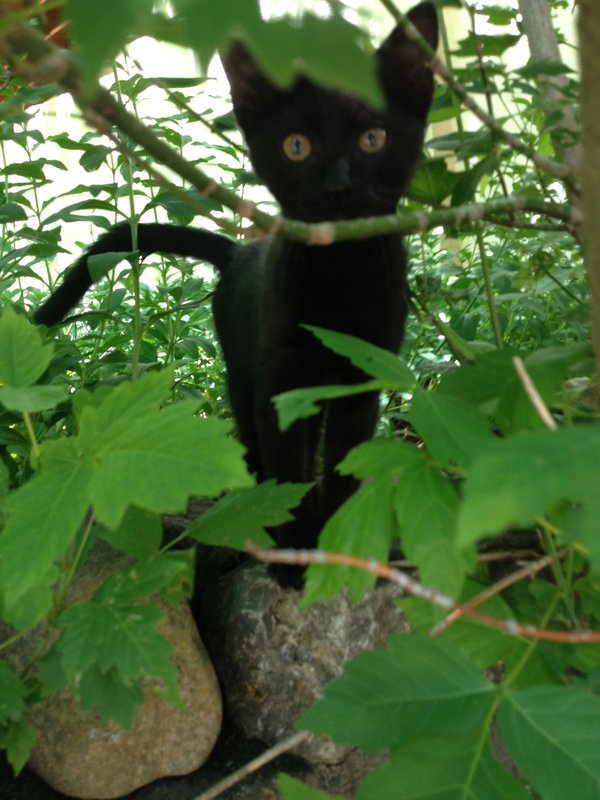 Sometimes she even calls her Bagheera the Panther. And sometimes I just throw Lopez on the end because of a little joke I know. EK is convinced she’s a boy. I’m not completely convinced she’s a girl, but I think I have a little more experience with determining that, and how do I explain that to a 2 year old. I’m as dumb as they come when it comes to cats, so I’m not 100% about anything. For the last couple of days, Rocky Muffin Bagheera the Panther Lopez has wandered in the house. Skittish and scared. She’s also wandered on top of the kitchen table. Curious and bold. I was torn about this whole cat thing until I noticed I don’t seem to have any allergy to this one. Then, when she chowed down on some shared Ramen noodles, I knew she was destined to be a part of our family. Now she rubs up against our legs, wrapping herself around them purring so sweetly. Today she jumped on my lap when I was sitting outside. I gave her a saucer of buttermilk and I think we’re pretty much BFF’s now. Black cats are even considered to be good omens in some cultures, bringing good fortune. In that case, maybe we should call her Lucky. Rocky Muffin Bagheera the Panther Lucky Lopez—-Welcome. The past two days, EK has woken at six bells. Because the sky is not dark, she thinks it’s time to get out of bed. I wholeheartedly disagree with this concept. Yesterday morning, I handed her my phone with Peppa Pig primed and ready to view, rolled over, and went back to sleep. Some days, you just gotta do what you just gotta do. I don’t feel a bit guilty about that. Well, maybe just a tad. Half of everything she knows, I owe to some animated being, whether it be Elmo, Barney, Cinderella, Ariel, or good ol’ Peppa. Some I’m thankful for, and some not so much, but it is what it is. In one particular Peppa episode, they visit a duck pond. So EK got it in her head that we should to. This posed a couple of problems. 1) I don’t know where a duck pond is in this area. So we did the next best thing and made our own in three easy steps that didn’t require us having to brush our hair. 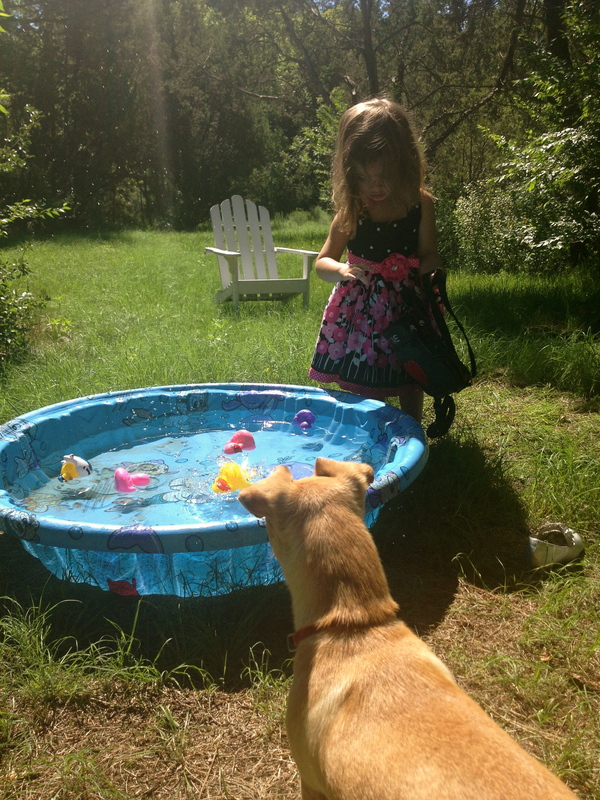 STEP THREE: Put on your “babing suit” and swim with the ducks. 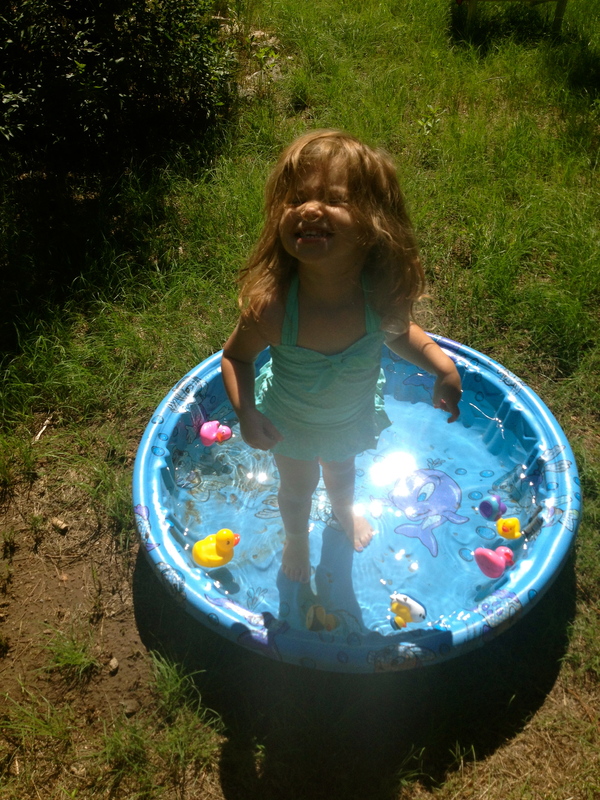 A duck pond and a big smile. And it didn’t even cost a loaf of bread. I have this little girl who is as prissy as they come. She insists on wearing dresses and silver high heels everyday. We fight over her hair, already. She wins. She’ll only wear dresses that have a sash on it. She compliments my make-up (when I wear it) and comments on other girls’ clothes and shoes. It’s a little bit crazy. I don’t remember being like this when I was a little girl, and I’m certainly not like this now. Have I told you I’m letting my hair go gray? Yeah, I am. I do remember a small spell I went through about the age of 7 where I wanted to wear the same skirt every day of my life. It was taffeta. Black, white, and red checked. I loved the feel of it and the sound of it. It twirled, like really good. My mom hid it from me eventually and claimed she didn’t know what happened to it. I understand her desperation now. Other than that, there was a lot of bracelets I wore to school around the age of six. My dad said they sent me to school looking like a gypsy. But that was really about the extent of my girliness. The rest of my time, I was just average in the prissy department. So I’m kinda treading on unchartered territory with this over-the-top fancy stage. And to think she’s only two years old. My only hope is that this stage of princess poo-poo is a phase and preferably a short lived one, or lordy mercy, we are in for it people. As much as I love to share her cute dress up pictures, I really love it when I can share pictures like the ones below. We went camping and I accidentally on purpose forgot to pack her heels. That left her no choice but to wear t-shirts and shorts. 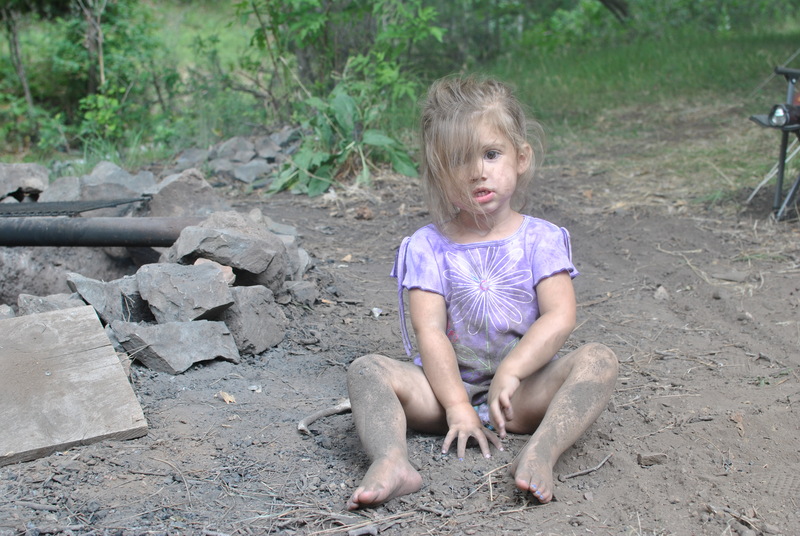 She got a little bit crazy with the dirt. It kind of made me cringe at first, thinking maybe she would get worms or something, but then I just rolled with it. I don’t even know how one contracts worms, but somewhere in my brain I have it filed in the same drawer as playing in the dirt. She just doesn’t like wearing pants. There’s just something about them I guess. 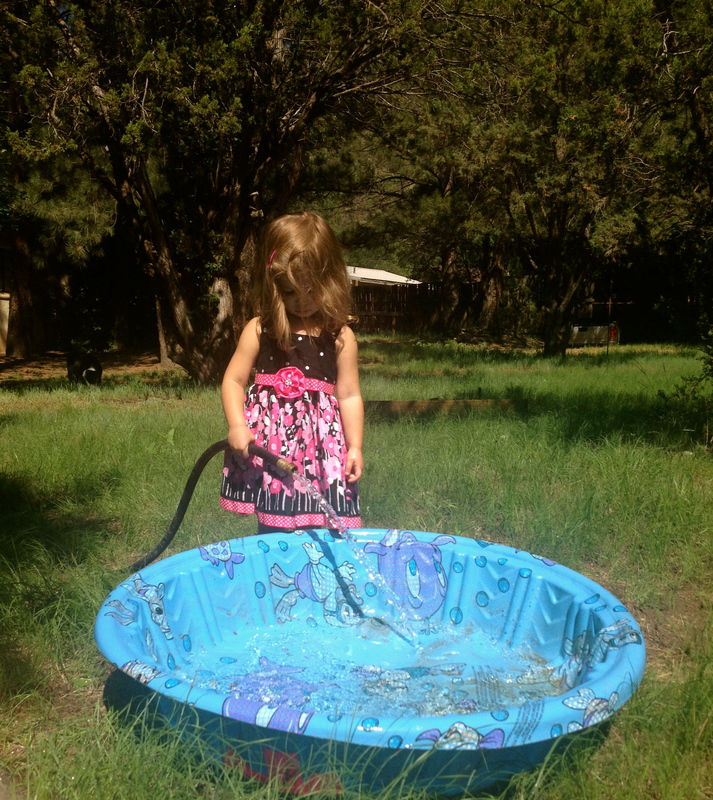 So she traipsed around in her undies, barefooted and had a fine time. 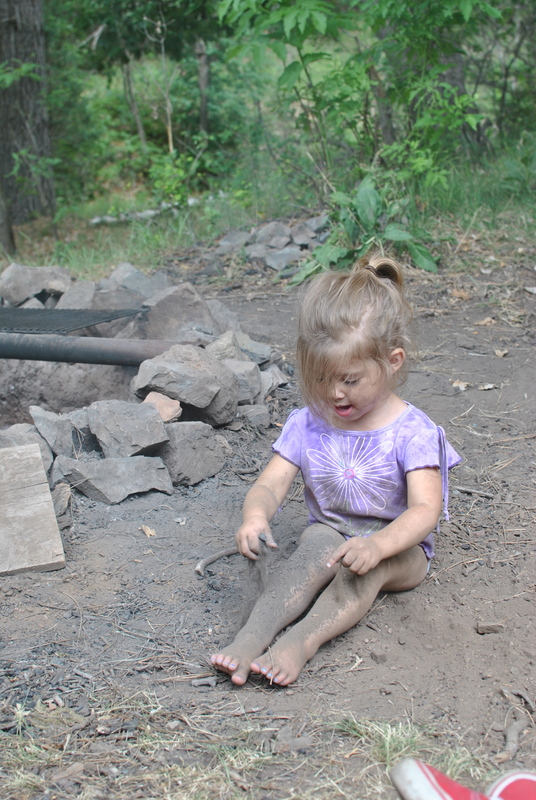 Then when she discovered the dirt, she was like backyard chickens taking a dirt bath. It did my heart some good to see her get down and dirty. There is hope that she might turn out okay. When she was done, I took a rag and some water and sponge bathed her, so the funny thing is, she was probably the cleanest of us all. But you can bet after we made it home, she asked to put on her dress right away, even before her real bath.